Sea front estate for sale in Agios Spyridon, North East Corfu. This unique, sea view estate for sale is set on a secluded hillside, amidst lush olive groves. The Estate is made up of a small hamlet of properties all of traditional Corfiot architecture and is harmonically met with modern day aesthetics. It consists of 1 villa, 2 bungalows and a separate cottage surrounded by a beautiful garden with a pool. 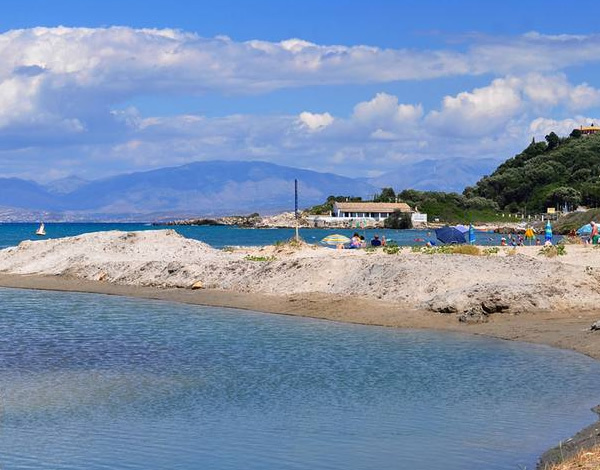 The beach of Agios Spyridonas is just 500 meters away. A small stone path leads from the property directly down to a small , very secluded beach. The stone-built holiday complex features romantic, country-style interiors with distressed wood furnishings, organic materials and hand-painted details. Each unit consists of 2 bedrooms, a living room and a fully equipped kitchen. The Cottage is located inside the property, on a secluded hillside. It is the ultimate place to relax in privacy and discreet luxury. It consists of 2 bedrooms and an attic, that can accommodate up to 5 persons, 2 bathrooms, a fully equipped kitchen and a living room. In the backyard there is a private pool. The cottage has its own private entrance and parking spot. The nearest beach is 50 meters from the complex, while bars, restaurants, horse riding & cycling facilities, fishing, scuba diving and a playground can also be found within proximity. The main town and port of Corfu are 40 km away.